Vittoria Vici's House is a large house in Solitude and home of Vittoria Vici. However, if you have killed her during the Dark Brotherhood quest, it will be inhabited by her friend. 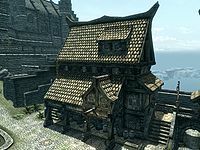 It is next door to Proudspire Manor and across the street from Solitude's Hall of the Dead. There are three entrances and three floors, The main door is up a flight of stairs opposite Proudspire Manor. The second, also up a flight of stairs and is at the other end of the building and the third is below the second and leads directly into the first floor. the first two entrances both lead to the Second floor. They are all apprentice locked. There is a Loot shadowmark on the wall to the left of the main door. The second floor overhangs the ground floor and has arches supporting it at the front. Under this overhang are a couple of piles of firewood and several food barrels. At the rear of the building, once you have completed the Thieves Guild reputation quest in Solitude, is a barrel marked with the Cache shadowmark. There is a hanging moss growing from the roof, but it is out of reach. Upon entering you are in a large room with two narrow table against the northeast and southeast walls, they hold an iron dagger and a bowl containing tundra cotton. There are two bookcases against the southwest wall holding mainly common books, but also a copy of Arcana Restored, a flute, a potion of extreme stamina and a solution of strength. In the center of the room is a low table with a chair and a wooden bench. On the table is a goblet, a bottle of spiced wine, a common book and a plate holding a sliced eidar cheese. There is an alcove to the northeast at the rear of the room with a cupboard holding a deathbell flower and a copy of The Firmament against the northwest wall. Above this is a wall shelf with two cabbages on it. To the left is a second wooden bench. Against the northeast wall is a set of shelves holding a copy of The Cake and The Diamond, a bunch of tundra cotton, two goblets, a draught of strength, a potion of health, a potion of regeneration and a basket containing two bunches of lavender. Beside this is a sack of foodstuffs. To the northwest is an opening with a central pillar. An open corridor leads to the stairwell, with stairs leading up and down. To the left of the pillar is an open corridor leading to the second entrance. There is a wooden bench against the southeast wall. Against the southwest wall is a long open box containing a bunch of tundra cotton, a skull and a sabre cat pelt. Further along the wall to the right is a small cupboard holding a jug. Against the same wall, right by the entrance is an unlocked chest and a set of shelves holding two slaughterfish scales, a bowl of glow dust, a potion of haggling, two bottles of frostbite venom, a deathbell flower, a bowl of void salts and a basket containing two bunches of lavender. Opposite this is another set of shelves holding copies of Beggar Prince, A Gentleman's Guide to Whiterun, The Windhelm Letters, Biography of Barenziah, v1 and v2, a goblet, a deathbell flower and a basket containing a bunch of tundra cotton. To the northeast is a door to the kitchen, containing a cupboard opposite the door, with the main part of the room to the left. On the northeast wall is a large fireplace with a stone mantle holding a bowl, two goblets and a bottle of frostbite venom. On the hearth is a piece of raw beef and a cabbage in a cast iron pot. To the left is a vase containing a snowberry bush and to the left of this is a unit holding a bottle of alto wine, a goblet and two cups. Against the northwest wall are two sets of shelves holding more goblet, a jug, two goblets, two slaughterfish scales, a bowl of glow dust, a potion of haggling, two bottles of frostbite venom, a deathbell flower, a bowl of void salts and a basket containing two bunches of lavender. Further to the left on the same wall is a cupboard with a platter holding two sweet rolls, two boiled creme treats and four red apples. In the middle of the room is a large table with three chairs holding a potion of regeneration, a bunch of tundra cotton, three goblets, two seared slaughterfish, three salmon steaks, a baked potato, on three plates, a loaf of bread and two goat cheese wheels. Against the southwest wall is a rack hanging two elves ears, a garlic braid and a bunch of frost mirriam. To the left of this is a narrow table holding an iron dagger, bowl of bread and plate holding a sliced eidar cheese. Above this is a wall shelf holding a bottle of Nord mead. Finally against the southwest wall is another cupboard. At the bottom of the stairs is an alcove to the right with a cupboard holding a couple of sacks, a bowl and cups and a set of shelves full of mead barrels, a bottle of wine and two bottles of Nord mead. Opposite the alcove is a room containing a display cabinet holding a steel battleaxe, to the left of this is a small wardrobe with a chair beside it holding a goblet and jug. Against the northeast wall is a cupboard, with a cooking pot on a stand to the left of this. On the other side of the cooking pot is a long wooden table and bench holding exactly the same as the table upstairs. Against the southwest wall is a cupboard with an open crate on top holding five red apples and three potatoes. To the northwest is a short corridor leading to the third entrance with a small wardrobe against the northeast wall. Straight ahead from the bottom of the stairs there is a cupboard against the northeast wall holding several cheese wheels, two loaves of bread and a sheaf of wheat. Hanging from the ceiling are a total of six garlic braids. To the right of the cupboard is a rack hanging two elves ears, a garlic braid and a bunch of frost mirriam. Against the southeast wall is a cupboard holding a gourd, three garlic bulbs, a set of fine clothes and a pair of boots. Against the southwest wall are two alcoves housing two large vats with food barrels behind. Up the first flight of stairs you pass a large vase holding a snowberry bush. At the top of the stairs is an L-shaped balcony with a unit holding a bottle of alto wine, a goblet and two cups. To your right against the southwest wall is a narrow table holding a bowl containing a bunch of tundra cotton, with a small table holding a large vase containing another bunch. To the left of the table are two more bookcases holding several common books as well as a copy of Charwich-Koniinge Letters, v3, a potion of extreme stamina and a solution of strength. There is a low table and chair in front of the bookcases holding a plate of bread and cheese and a common book. Against the southeast wall is a wooden bench. Turning left at the top of the stairs, there is a cupboard against the northwest wall holding a flute, a drum and a potion of health, with a wall shelf above holding a deathbell flower and a copy of A Minor Maze. There is a door to the northeast the opens into an L-shaped bedroom, to your right, is a narrow table against the southeast holding a plate of three red apples and a platter holding a sweet roll, a baked potato and a sliced goat cheese, and in front of this is a low table and chair holding a goblet, a potion of regeneration and a plate of bread and an eidar cheese wedge. Opposite the door is a large vase containing a bunch of tundra cotton on a small table and the rest of the bedroom to the left. The large double bed is coming diagonally out from the western corner, with a long unlocked chest at the foot of the bed. In the southern corner is a small wardrobe holding a jug and two goblets, with a chair to the right of it and a washbasin on a stand to the left. Beside this is a basket hiding a small coin purse. Against the northwest wall is an unlocked safe and tall wardrobe containing fine clothes. Against the northeast wall is a second long unlocked chest, with a small wardrobe to the right of it holding a goblet. The keys to the house are carried by Aquillius and Vittoria. This page was last modified on 2 April 2017, at 00:05.